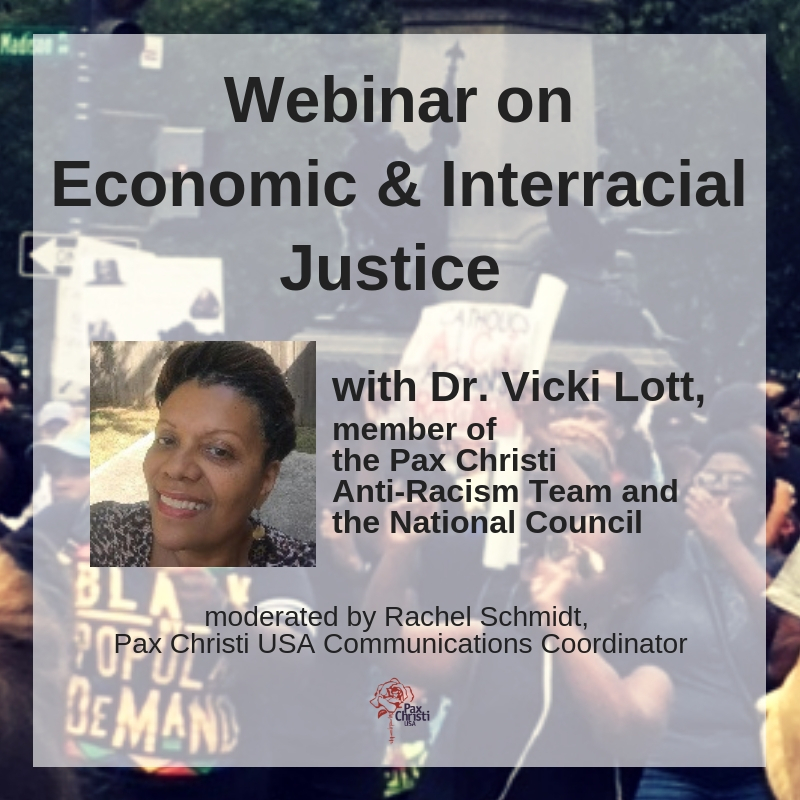 The Pax Christi USA Anti-Racism Team’s commitment to the elimination of nuclear weapons is based in the recognition that racism plays a virulent role in matters of war and peace. In particular, the testing and deployment of nuclear weapons has been directed disproportionately against the bodies and lands of people of color, whose lives and safety arguably have been viewed as more expendable than other populations. Further, the diversion of vast dollars to the stockpiling, movement, and “modernization” of weapons of mass destruction ensures inadequate funding for programs for people in poverty, who are disproportionately people of color, both globally and domestically. We are deeply graced and profoundly grateful to live on a planet teeming with life and vitality. We share the Earth with millions of other living beings that reside in your rich soils, arid deserts, and towering mountains; your abundant waterways and deep oceans; your vast skies, grassy meadows, and tall forests. We share not only this commonality of existence but, sadly, a commonality of grave global peril: nuclear weapons. Nuclear weapons threaten to obliterate all that you have given us. Human greed, militarism, and hubris have led us all to the edge of a cliff, beyond which there is no survival. There is no “winning” a nuclear war; a single strike could unleash forces that can eradicate life forever. There is no nation, no people, and no way of life impervious to the reality of nuclear war. Give us the courage to stand firmly against the very existence of nuclear weapons. Let us learn, advocate, and agitate for a nuclear-weapons ban and the elimination of such weapons from the face of this planet. We cannot gamble with your precious gifts, nor continue to live at the precipice of this nuclear abyss. Let us understand that our lives, and the life of your earthly creation hang in the balance. The horrific, existential threat of nuclear weapons to the earth and all its creatures was first made clear on August 6 and 9, 1945, when the United States dropped atomic bombs on Hiroshima and Nagasaki, instantly incinerating thousands and eventually killing many more due to outrageous, radiation exposure – nearly one quarter of a million total. This misuse of power by the US created the fear that precipitated the efforts of other nations to acquire their own nuclear weapons. First the Soviet Union, (now Russia,) and later the United Kingdom, France, China, India, Pakistan, Israel, and North Korea. The increase of nuclear arsenals also included extensive nuclear “testing” in the Pacific islands, where the majority are people of color, including the Bikini Atoll of the Marshall Islands. They were called “tests,” but the Pacific islanders experienced radiation poisoning, injuries, and the loss of their ancestral homes. Like the “Kibakusha” – the people of Japan who survived the hellfire of the atomic bomb – the Pacific Islanders have been tireless prophets in the movement to end nuclear weapons. Nuclear weapons are the most volatile weapons of mass destruction that have ever existed, and their use cannot be limited to combatants. They kill massively, destroying everything in their expansive range, and leave irreversible injuries to the humans, creatures, and creation that survive. Yet ironically, while other, less-destructive (though still horrific) weapons, including chemical and biological weapons, are illegal, there is no such legal prohibition against nuclear weapons. In 1968, concerns about the proliferation of nuclear weapons resulted in the adoption of the “Treaty on the Non-Proliferation of Nuclear Weapons” (NPT,) ratified in 1970. Under the NPT, the nations with nuclear weapons agreed to disarm if nations without nuclear arsenals agreed to never acquire them. However, there was no timetable for disarmament set, and nearly 50 years later there are 14,900 nuclear weapons in existence. The US has 6800 and Russia has 7000, and nuclear nations continue to substantially invest in “modernizing” their arsenals, which really means enhancing the mobility, deliverability, accuracy, and lethal character of their weapons. Often, deterrence is suggested as a logical reason for amassing nuclear weapons; that is, the threat of mutually-assured destruction keeps any country from ever pushing the nuclear button. This is nonsense. Deterrence is a myth, and the risk of power-hungry and vengeful heads of state being in charge of nuclear arsenals, accidental nuclear war due to faulty intelligence, nuclear malfunctions, or the risk of theft by non-state actors of nuclear capability are too deadly to chance. Faced with the refusal of nuclear nations to meet their legal, NPT obligations to disarm, a number of non-nuclear nations have elected to take another route of action. In 2016, more than 120 nations voted in favor of convening a UN conference in 2017 to negotiate a treaty that would declare all nuclear weapons illegal. The first session of that conference was recently held in New York, March 27-31, 2017. At least 132 nations and a host of organizations – including Pax Christi International, experts, and representatives of civil society participated in the conference. The United States and the other nuclear nations boycotted the proceedings, and they directed their NATO allies to do the same. The Nuclear Ban Treaty negotiations will resume at the United Nations in New York for three weeks, beginning June 15, 2017. The anticipated treaty would prohibit the development, possession, transit, use, threat of use, stockpiling, and financing of nuclear weapons. While this treaty would not itself rid the world of nuclear weapons without the participation of nuclear-holding countries, it is hoped that a clear statement by 132 of the world’s countries will begin to inspire revulsion, rather than awe, for the world’s deadliest arms and advance the goal of eliminating nuclear weapons. Read the Statements by Pax Christi USA and Pax Christi International regarding the Nuclear Weapons Ban negotiations. Write a note or email to President Trump, Secretary of State Tillerson, UN Ambassador Nikki Haley, and your elected US congresspeople requesting that the US participate in the upcoming Nuclear Weapons Ban Treaty talks. Share with your friends and family information about the drafted Nuclear Ban Treaty. Given the US boycott of the Nuclear Ban Treaty, there is little information being shared in this country about it. Here is a talking point builder for campaigners on the nuclear ban treaty. Send letters to the media requesting that they cover the upcoming Nuclear Ban Treaty negotiations in June. Post support for the Nuclear Ban Treaty on social media, including Facebook, Twitter, and Instagram. Nuclear weapons are big business. Review information about global financing and manufacture of nuclear weapons, and the campaign to divest. See the joint iCan / PAX report entitled “Don’t Bank on the Bomb.” Write letters to financial institutions requesting that they cease funding nuclear weapons. Ask your place of worship to host a discussion regarding the morality of nuclear weapons. Publicize Pope Francis’ calls for the elimination of nuclear weapons. Participate in public demonstrations including “Ban the Bomb” marches in various cities.